Our shop is entirely dedicated to providing purchasing options to the gentleman forgotten by the High Street - the full figured, tall or petite! We offer everything from underwear to suits in sizes that range from 34" - 66" waist and chest! We also offer a full range of footwear from size 6 to 16. Don't just take our word for it. Make an appointment to come and visit us and enjoy a cup of tea or coffee while you do. Monday - Friday 9.00 am to 5.00 pm and Saturday 9.00am to 4.00pm. Dalziel Menswear is one of the largest stockists of king-size menswear in the southeast and has been open for business in Woking, Surrey, since the 1930's. Having passed from father to son to grandson, the business is now run by Bruce McLaren. Since the mid 80's, the business has concentrated on outsize menswear and is well known throughout the United Kingdom in this niche market. The company ethos is to provide an excellent service and value for money to you, our customer. The shop is located at 7 York Road, Woking. 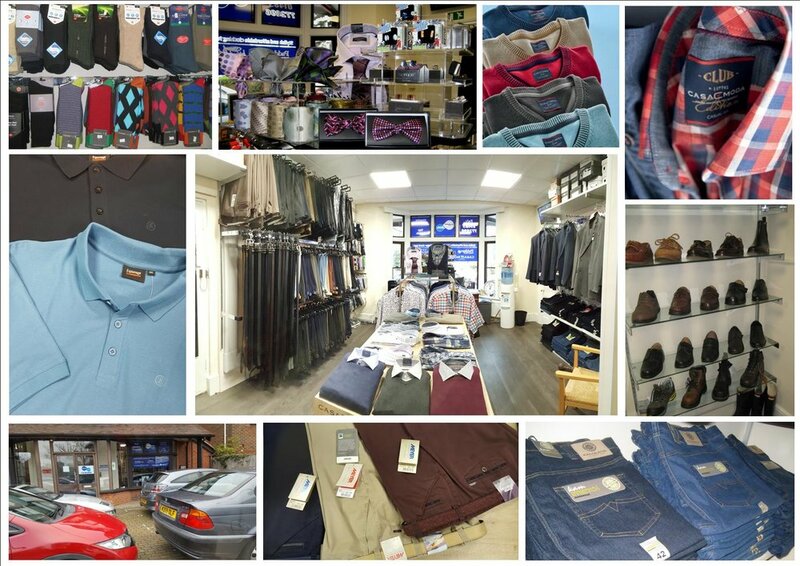 The recently refitted shop offers a selected range of outsize menswear including well known brands such as: Casa Moda; Meyer; Digel; KAM stretch jeans; Hattric jeans; . A selected range of footwear (some styles up to size 15/16); classic Loake; super-comfortable wide-fitting Roamers; Chatham shoes & boots and trainers are available to choose from. A selection of shirts, t-shirts, polo shirts, jumpers, slip-overs, jackets, suits, coats, trousers, shorts, swim shorts, pyjamas, underwear, socks, ties, belts, cufflinks, slippers and footwear are available to purchase. Special orders can be made for you if an item is not available in the shop. And, because no one is made to a pattern, we also offer an alterations service. Do make an appointment to come to the air-conditioned shop to check it out for yourself. The shop parking area is at the back of the building. The shop can be accessed from the front of the building. Go through the first set of doors and locate our buzzer for admittance. We look forward to seeing you soon. The building housing the business was originally bought in 1921 by Walter McLaren (Snr) trading as a general clothing shop with also household goods such as towels and bedding. A large element of customers ran budget accounts with a home collection service. When re-decorating recently, we found some hand written leather bound ledgers from this era of the business. It was amazing to realise that some of these families are still doing business with us. For that, we are very grateful. In 1953 the business went through another generation with Walter (Jnr) joining. The senior Mclaren died in 1975 and 1979 saw the next generation join, in Bruce. Over the years the business evolved and bigger sizes were stocked more and more, 1998 saw the decision to leave the home credit market and concentrate on the outsize market with Walter taking a well earned retirement. This year, 2018, the business has again evolved. The premises and the running stock have been downsized and we have moved to offering a more personal service. As customers visit us when an item is needed, wanted or by referral; the decision was made to offer an appointments service. Customers are still welcome to drop in, you will still find a warm welcome and we will do our best to accommodate you. If you are looking for something specific or making a special trip to visit us we recommend calling ahead to avoid disappointment.